Sure, you’d love to have a real rhino for your kid’s 8th birthday party. I mean come on: rhino rides for everyone all afternoon! Pony rides are fun and all, but you want those kids to remember the day? Call in the rhinos! But good grief, the reams of permits and insurance forms you need for that. 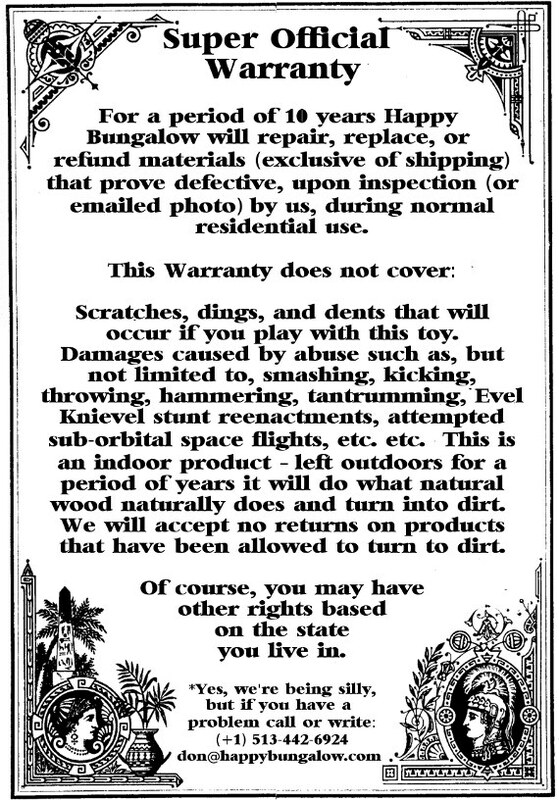 And they’d probably do some damage to the lawn (rhinos are on the heavy side). Not to mention the rhino’s notorious poor eyesight. If one mistook you cherry tree for a ne’er–do–well lion – goodbye cherry tree. 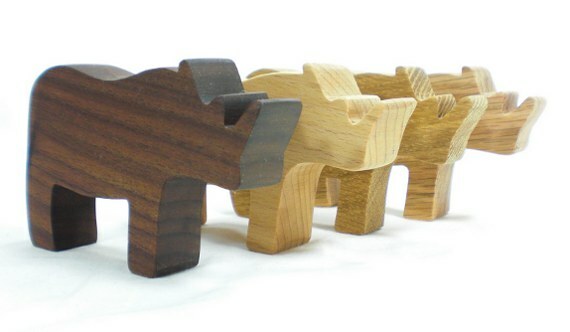 Perhaps we’d better stick with wooden toy rhinos to make your party unforgettable. Every Happy Bungalow rhino favor is made to order just for your party, ready in about a week. We use natural hardwoods (no stains) like ash, cherry (though not charged down by a near-sited rhino), hickory, maple, oak, poplar, red oak, sassafras, and walnut. 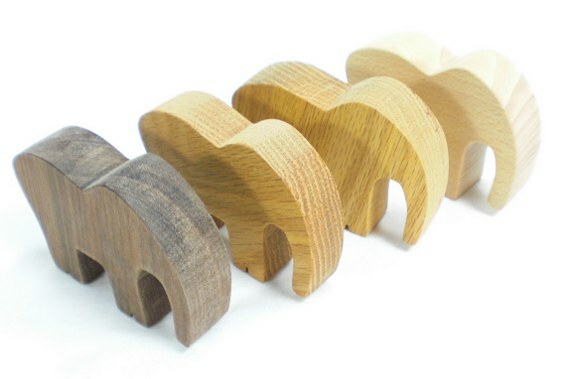 Pick up your own wooden toy rhinos from our online toy shop today. You’re throwing a party but don’t know what to give for party favors? Cash is easy, but seems impersonal to for 8 year-olds. Candy just ends up creating hyper-manics or screaming-tantrums. Those plastic toys from the party store are cheap, but they end up in a landfill before the week is out. 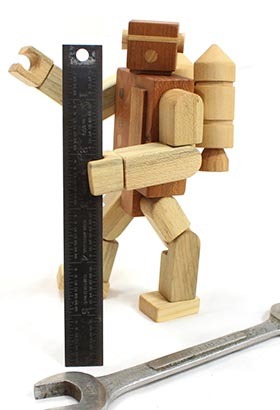 What you need are handmade, natural wooden toys that these kids’s kids will be playing with. 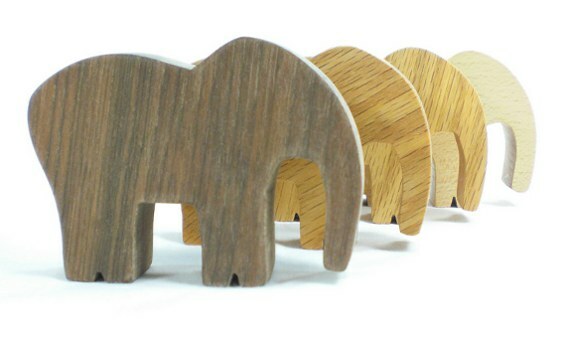 Give your party goers a favor they’re certain to remember: a natural, handmade wood elephant. Every animal favor is made to order just for your party, ready in about a week. We use natural hardwoods (no stains) like ash, cherry, hickory, maple, oak, poplar, red oak, sassafras, and walnut. 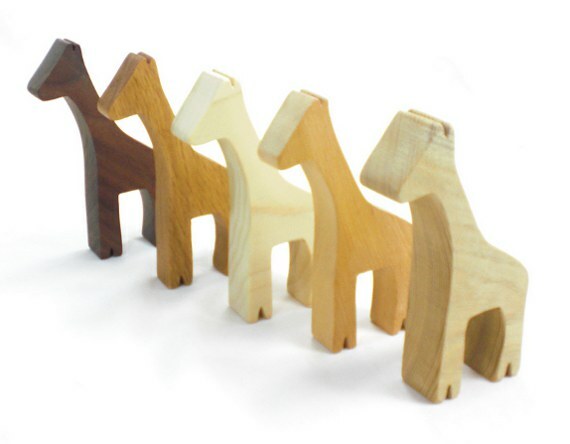 We’ll make your animals from a mix of these woods or use a custom wood selection to your liking. We sand all the wood by hand until it’s smooth and protect the wood with a beeswax polish we make ourselves. 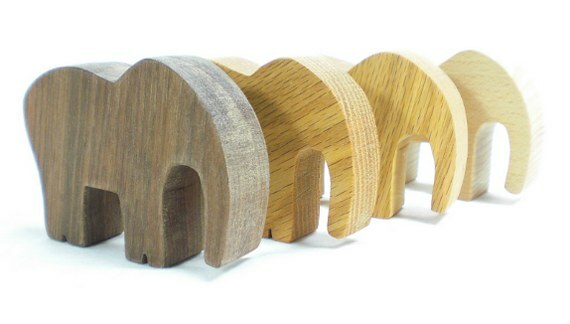 These wooden elephants are available right now in our shop. Click here to take yours home today. 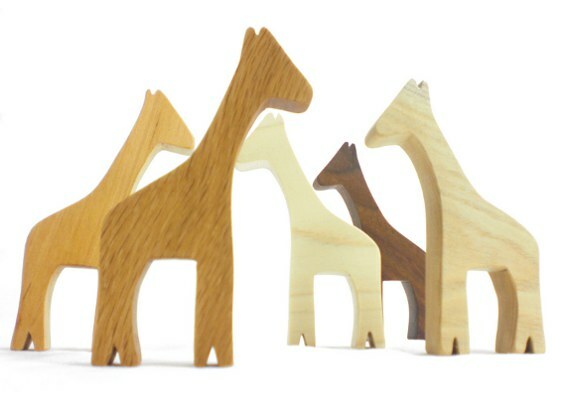 With these giraffes you won’t have to stretch yourself to find the perfect favor for your guests. Okay, we’re fans of lame jokes, but we take toy-crafting seriously around here. We make these giraffes (and all of our toys) to last. Every piece is cut individually and crafted with care. We sand all the wood by hand until it’s smooth and protect the toy with a beeswax polish we make ourselves. Every animal favor is made to order just for your party, ready in about a week. We use natural hardwoods (no stains) like ash, cherry, hickory, maple, oak, poplar, red oak, sassafras, and walnut. 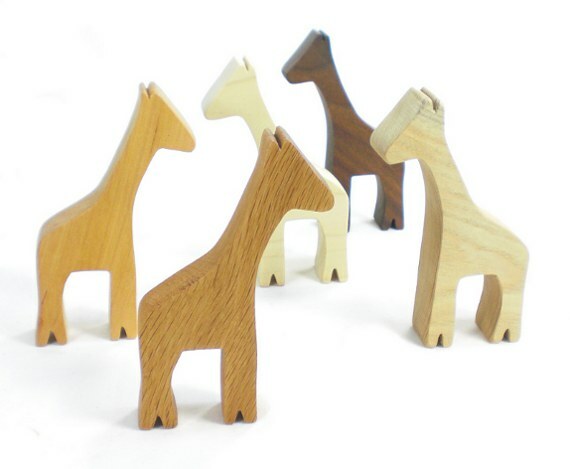 We’ll make your animals from a mix of these woods or use a custom wood selection to your liking Saunter over to our webstore and take home some of these long-necked beauties today.